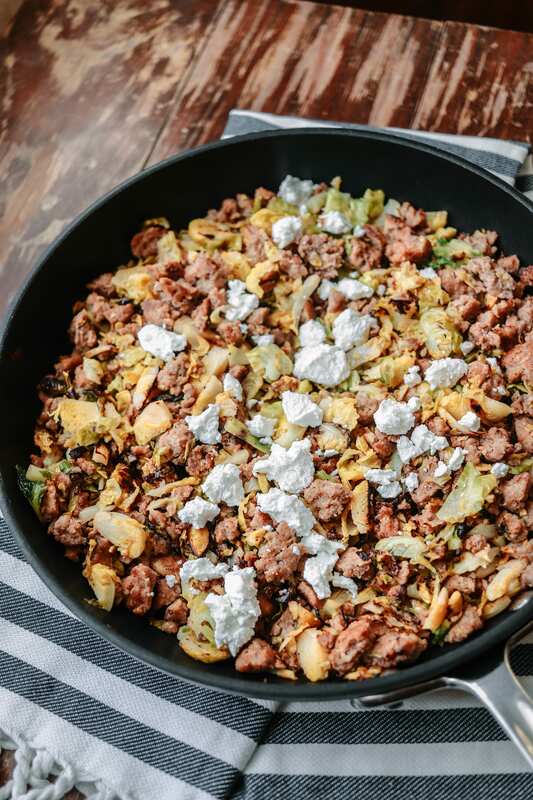 Low carb breakfast hash made with all of the goodies – chorizo made with locally sourced, pastured raised pork, brussels sprouts, and goat cheese. Picture yourself sitting at your dining room table or perhaps seated on your comfy couch while watching the morning news. The comforting aroma of your cup of hot coffee envelops your senses. You slowly bring the cup to your mouth and you take a sip of the coffee, ever so happy to experience the sweet taste of the jolt of energy that brings you to your senses each morning. Next you contemplate breakfast. Because of your health goals, you yearn for something gluten free and low carb. 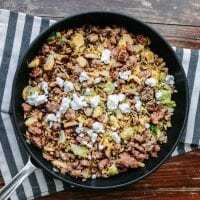 Eventually you decide to get up off the couch, make your way to your cozy kitchen and cook this Low Carb Breakfast Hash. Low Carb Breakfast Has is made with locally sourced (to Florida), slightly spicy Chorizo sausage. Make your own homemade chorizo sausage if you can’t find locally sourced or additive free sausage. 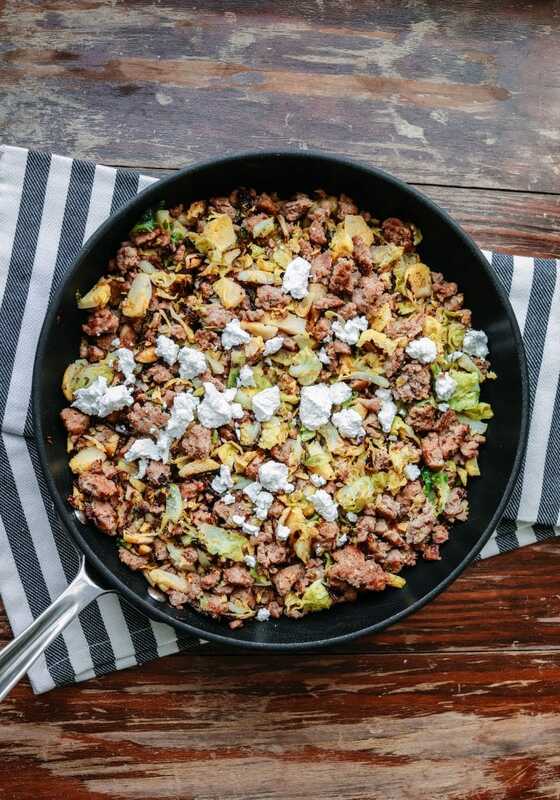 In addition to the chorizo sausage, this easy skillet recipe is filled with nutrient dense, soft and tender sauteed brussels sprouts. Finally, after cooking this healthy low carb recipe, you sprinkle it with soft and creamy goat cheese (also called Chèvre). Grab your fork and dig in. Heat a 10 inch skillet over medium high heat. If your chorizo sausage is in casing, remove it from the casing and place it in the skillet. Break it up with a spatula or wooden spoon and cook until almost browned. Add the brussels sprouts, garlic powder, sea salt and black pepper. Cook for about 10 minutes or until the brussels sprouts are tender. Remove from the heat and divide into four equal 5 oz portions and divide among 4 plates. Alternatively, if you will have leftovers you can place the leftovers in storage containers. Top each plate or leftover portion with 1/2oz of goat cheese. Serve with fried or scrambled eggs for more protein. *Nutrition information is calculated using My Fitness Pal and is approximate. 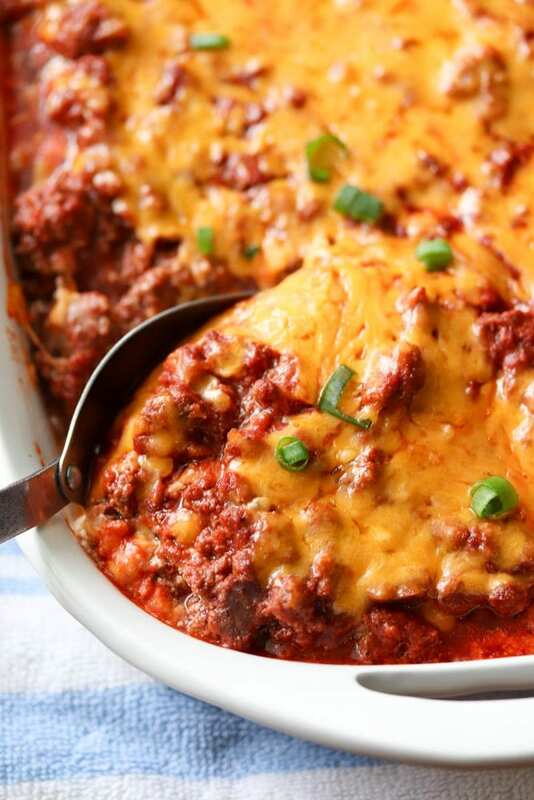 It’s the kind of casserole that you can eat boat loads of without feeling super guilty because it’s low carb.